In order to power entire communities with clean energy, such as solar and wind power, a reliable backup storage system is needed to provide energy when the sun isn't shining and the wind doesn't blow. One possibility is to use any excess solar- and wind-based energy to charge solutions of chemicals that can subsequently be stored for use when sunshine and wind are scarce. At that time, the chemical solutions of opposite charge can be pumped across solid electrodes, thus creating an electron exchange that provides power to the electrical grid. University of Rochester researchers, working with colleagues at the University at Buffalo, believe they have found a promising compound that could transform the energy storage landscape. In a paper published in Chemical Science, an open access journal of the Royal Society of Chemistry, researchers in the lab of Ellen Matson, assistant professor of chemistry, describe modifying a metal-oxide cluster, which has promising electroactive properties, so that it is nearly twice as effective as the unmodified cluster for electrochemical energy storage in a redox flow battery. 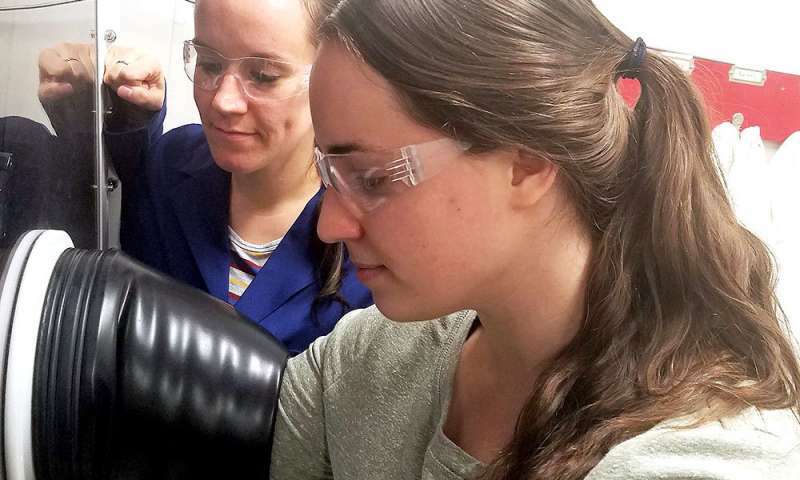 "Energy storage applications with polyoxometalates are pretty rare in the literature," says lead author Lauren VanGelder, a third-year Ph.D. student in Matson's lab. "There are maybe one or two examples prior to ours, and they didn't really maximize the potential of these systems." "This is really an untapped area of molecular development," adds Matson. However, by making what Matson describes as "a simple molecular modification"— replacing the compound's methanol-derived methoxide groups with ethanol-based ethoxide ligands—the team was able to expand the potential window during which the cluster was stable, doubling the amount of electrical energy that could be stored in the battery. The electrochemical testing required for this study involved equipment and techniques not previously used in the Matson lab. Hence the collaboration with Timothy Cook, assistant professor of chemistry at the University of Buffalo, and Anjula Kosswattaarachchi, a fourth-year graduate student in the Cook lab. VanGelder visited the Cook lab for training on testing equipment, and in turn helped Kosswattaarachchi with synthesizing compounds. 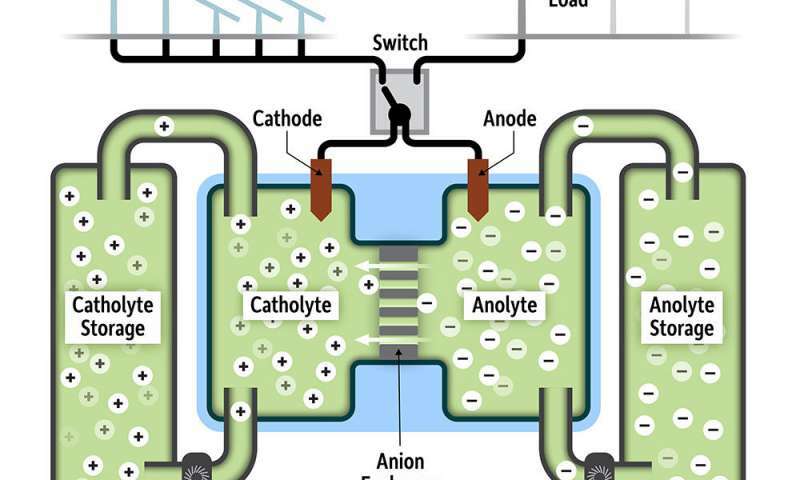 The two groups have applied for a National Science Foundation grant as part of an ongoing collaboration to further refine the clusters for use in commercial redox flow batteries. Matson stressed the "crucial role" played by VanGelder, who conducted the initial testing and experiments on the clusters while Matson was on maternity leave. "As a third-year graduate student, she did an incredible job of starting this project. She's played an important role in driving this research effort in the lab," Matson says.